London is a constituency of the European Parliament. It currently elects 8 MEPs using the d'Hondt method of party-list proportional representation. 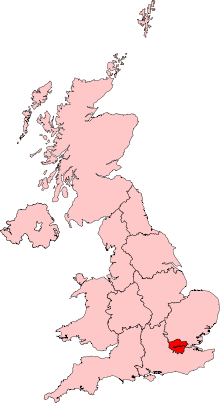 The constituency corresponds to the Greater London region of England, in the south east of the United Kingdom. Prior to 1999, London was represented by a number of single-member constituencies. These were London Central, London East, London North, London North East, London North West, London South East, London South Inner, London South West, London West, and parts of London South and Surrey East. 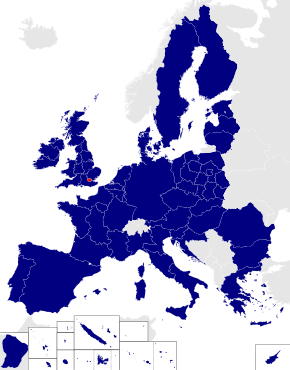 The European Parliamentary Elections Act 1999 reduced this to a single constituency returning a number of MEPs. Below are all the members since the creation of the London constituency. The number of seats allocated to London has been reduced from 10 to 8 between 1999 and 2009 due to EU enlargement. Members elected in 1999 who previously represented a London constituency were Pauline Green (London North, elected 1989) and Robert Evans (London North West, elected 1994). ^ "european elections 10–13 june". European Parliament. 10 June 2004. Retrieved 11 June 2011. ^ a b "Candidates | European Parliament Information Office in the United Kingdom". Europarl.org.uk. Archived from the original on 10 May 2009. Retrieved 11 June 2011. ^ a b "United Kingdom European Parliamentary Election results 1979–99: London". Election.demon.co.uk. Retrieved 11 June 2011. ^ Elected to Chipping Barnet in the 2005 UK general election. ^ Appointed in May 2005 to replace Theresa Villiers. ^ Resigned in December 1999. ^ "Tower Hamlets Council ballot count resumes". BBC News. 25 May 2014. Retrieved 26 May 2014. ^ London European Elections 2014. "London European Elections 2014". Londoneuroelections.org.uk. Retrieved 18 May 2014. ^ "European Elections 2009: London". BBC News. 7 June 2009. Retrieved 11 June 2011. ^ Sohale Rahman. "Sohale Rahman | Representing Private Clients & Community". Sohale.co.uk. Retrieved 11 June 2011. ^ "資格を目指せ！取って広がる就職への道". Genealcantara.com. Archived from the original on 14 April 2014. Retrieved 13 April 2014. ^ "Andrew Popat, Esq, CBE Authorised Biography | Debrett's People of Today". Debretts.com. 31 December 1943. Retrieved 13 April 2014.